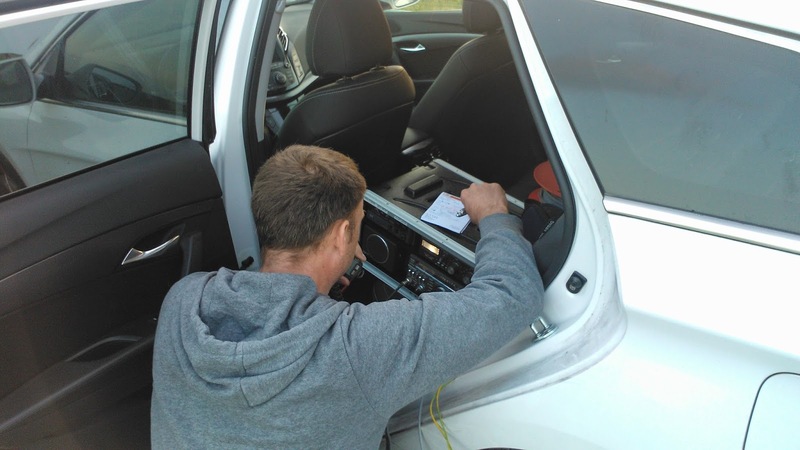 Field test EndFed Wire Antenna lifted by a Kite! Two weeks ago,Ramon (PE1OUW) asked me to join him and some other Ham`s on a field trip,where they would lift a wire antenna by means of a kite!I thought,yeah,why not ,interresting to see how a kite lifts a 20 meter wire antenna up in to the sky.So we went of to a location somewhere between the city of Purmerend and Amsterdam called Wijdewormer.On this location there`s plenty of space for the experiment and little to zero QRM. After we arrived,Ramon prepaired the kite and the other Ham`s set-up the Kenwood TS-430 HF transceiver.This transceiver was set up in a case for field day`s.There is also a antenna tuner and a external speaker in the case.After the kite was in the air,we tried to lift up a 40 meter wire with a 1:9 Unun balun.Because there was not enough wind,the wire was lifted only half way. Luckely,I brought my EndFed wire antenna with me.Because it consist of only half the lenght of wire (20 meters) in stead of the 40 meters with the 1:9,we managed to get the wire up in the air.So the kite was at 100 meters and the whole EndFed was up in the air like a vertical.Now we could start to make some calles.The first thing we noticed was the low QRM.As soon as we turned the radio on,a lot of stations could be heared.It wouldn`t take long before Ramon made his first QSO.We tested the EndFed wire on the band it`s supposed to work without the tuner.On 10,15,20 and 40 meters,the tuner was not needed.Very low SWR value`s.Only at the end of the 40 meter band at 7,199,5MHz the SWR was 1:2.Still no problem. We also did some QSO`s on the 17 and 80 meter band.Now the external antenna tuner was needed.On the picture you see me making a QSO on 40 or 80 meters,I,m not sure,on the Dutch vacation round. End Fed Wire Antenna for 10,15,20 and 40 meter band. A few months ago I bought a FT140-43 toroid to make myself a homebrew End Fed wire antenna,without the need for a tuner.As you all probably know,I use this comercial antenna with a lot of good rapports with my Bitx projects.In the mean time,I changed my 3-bands wire,for a 5-bands wire.Now I can work on the 10,15,20,40 and even on the 80 meters band without the use of a tuner.OK,back to the homebrew.The plan is to make a End Fed wire antenna for 10,15,20 and 40 meter band.What do we need.The FT140-43 toroid,a single 150pf capacitor (mine is 1KV),exactly 20 meters of DX wire,and a piece of isolated 1mm copper wire.Put it all in a little box with a SO-239 UHF-connector. 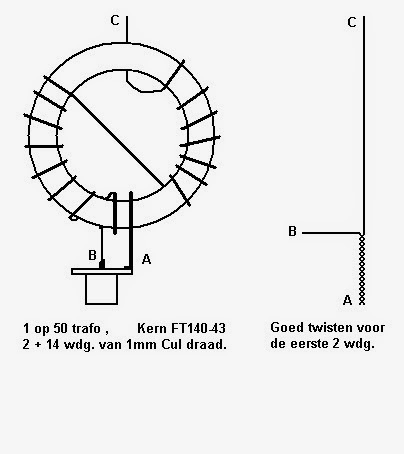 You can find a lot of info on the internet about the build of this End Fed wire antenna.A popular site among Dutch HAM`s is Zendamateur.com.There`s a whole thread about the build of this antenna.In the thread you can also find the scematic of the construction.On the picture bellow you see the how the antenna is build. Notice that the 150pf capacitor between the SO-239 is not displayed on the picture. Because I use only one FT140-43,the maximum SSB power the antenna can handle is 100Watts.In FM you can use 30-40 Watts,depending on the SWR.If the SWR get`s too high,it`s time to reduce your power until the SWR get`s better. Here is a picture of my EndFed wire antenna.Yesterday there was a field day of the YRC radio club on a nearby farm land.We connected the antenna on a 10 meter long fishing rod and hang out the 20 meters of cable.Just like I hoped,the SWR on all the bands (10,15,20 and 40 meters) was < 1.1,5.On 40 meters I made contact with the UK while there was a big pile-up.Big signal with the Yaesu FT897D (Thanks PA3KOE).We heared a Greek (SV) station on the 17 meter band.Now the tuner was needed and after a short tuning procedure we could work the HAM with a big 5-9.I think I can say,this antenna works great,it`s light to handle on a vacation,and you can build it for only €15,- Euro`s. Thanks to all the members of the YRC Ijmond Radio Club to let me do the tests.